People always told me how different girls and boys are. I grew up with a brother, so I believed these people. But, really. Boys and girls are different. The ways they go about doing things. The level of their noise. Their amount of movement. He chooses the blue plate. She wants the pink cup. Yet there are times they come together. And, truly, the times they do are my absolute favorite moments of being a mom to two. They can be sweet. They’re quite a team when they work together. They’re funny and creative. 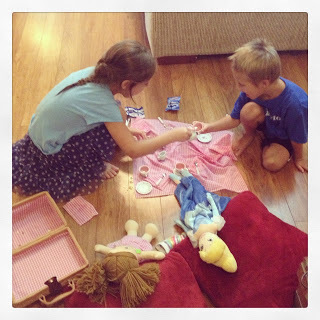 Lately, they’ve been watching “My Little Pony” episodes and having tea parties. Not necessarily together! Yes, these fall on the girl side of things. But they’ll argue that there are boy ponies and then proceed to name them. And, honestly, I’m not sure about the tea parties. But, hey, she likes that he’s a willing participant. And it’s good for him to sit still! So last week there was a tea party on a sheet in the kitchen. She had the four places set for the two of them and two dolls propped up on pillows. They had water to pour from one tiny pitcher into their even tinier cups. They had fruit snacks on miniature plates. You know, now that I think about it, the fruit snacks were probably what piqued Ben’s interest. Not two minutes after I took the photo above and posted it on Facebook, Twitter and Instagram, Ben climbed up on the arm of the nearby couch and jumped. Right onto the tea party. Feet first. Surprisingly, he didn’t break any tiny tea party dishes. Cate got tense. Like she was going to get mad. 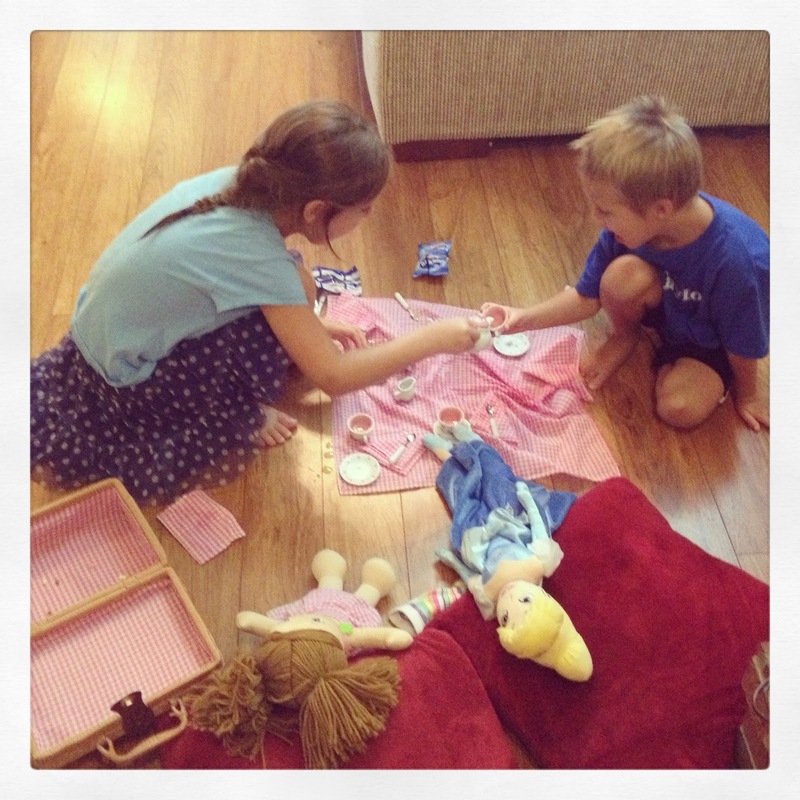 Because, really, what’s a boy-girl tea party without the boy causing a little ruckus?! I wonder what Apple Jack would do? Then the second part: Would you believe the tiny pitcher broke just before the next tea party? It’s still sitting on my kitchen counter waiting for some attention from the hot glue gun. Cate has settled for a gravy boat that we got for our wedding 11 years ago and have never used. It works, even though it’s like a giant next to the the tiny tea party set. And, as Cate would tell you, it has blue and green strips and not pink butterflies on it. I’m linking this ordinary motherhood moment with Crystal Stine’s Behind the Scenes. I love the way her link-up encourages people to show their real, imperfect lives. I love tea parties with my kids. Those are some of my greatest memories and photos! I do them with all four…including the boys! And yes, the food has to be a big draw! If you keep it going, they will get used to the sitting (and talking)! Oh, I totally hadn't thought about the training to sit and have conversations. Good thought! 🙂 Thanks for reading, Angie! Love it…especially the leap into the middle of the tea party. (My daughter would totally do something like that!) 😉 This is just all kinds of happy…and I think Maelie has that same Cinderella doll…isn't it funny the things in pictures that jump out at us? 🙂 Great post, friend…hope you're having a beautiful day! Yes – sometimes it's the background or other details that jump out to me too. Thanks, Mel, for your always-kind words and encouragement. So cute and hilarious! That says so much about your heart–and your daughter's . . .that you laughed. Just beautiful, friend. We don't always just laugh. 🙂 You're so sweet, Jennifer!